1919 Mar 29. 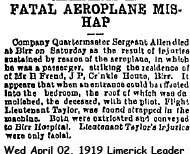 Died at Birr as a result of an aeroplane crash. Age 27. Son of Edward and Janet M. Allen; husband of Daisy Evelyn Allen, of 100, Elphinstone Rd., Hastings. Training for the trenches was carried out in the 14 acres at Crinkill where trenches were formed for tactical exercises. 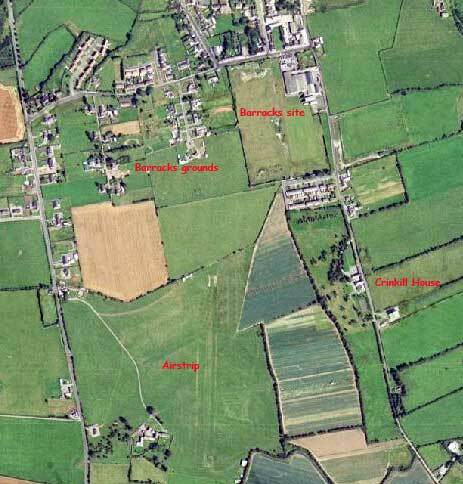 In 1917 an aerodrome was built in the 14 acres and three planes were kept there. The first air crash recorded in the area occurred when Sergeant Allen was killed. The plane crashed into Crinkill House south of the barracks and Sergeant Allen is buried in the military cemetery. There is a board in Crinkhill cemetery with a list of names interred in the cemetery, which is now very over-grown and neglected. The board is also cover with green moss and moisted from the weather. The list below is mainly men who died in South Africa but does include " Allen, Thomas; 1892-1919"